I was a bit lacking in design inspiration this week, so I went searching through my favorite jewelry magazine, Belle Armoire Jewelry. That magazine always, always inspires me, always makes me sigh and swoon over the beautiful, quality jewelry and the obvious time put into the creation of each issue. With a necklace spotted as a design inspiration, I went in search of the other part of creating a piece of jewelry: the color palette! For some people, dragging in a bright color is the challenge, and for some people, restraint is the challenge. I love colors and I love being bold with colors, so the challenge for me sometimes is to tone it down. Here enters my second inspiration for this piece, Miss Stephanie Dosen. Stephanie has a great love of pale, creamy colors. In her own words: white, stone, mouse, bone, dove, cream, sand, wheat, bark, wool, ash, heather, fawn, moss & mushroom. I wanted to create a piece that was mostly monochromatic, with lots of little tinkly, twinkly-sounding bits and a few charms. There’s a little white bird, a brass bell, a goddess, a butterfly, and a little silver leaf, all representing aspects of Stephanie’s personality. 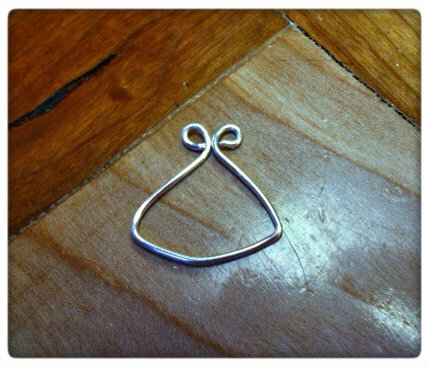 Tiny, open nickel spacers acted both as chain links in the necklace part and as spacers in the pendant. 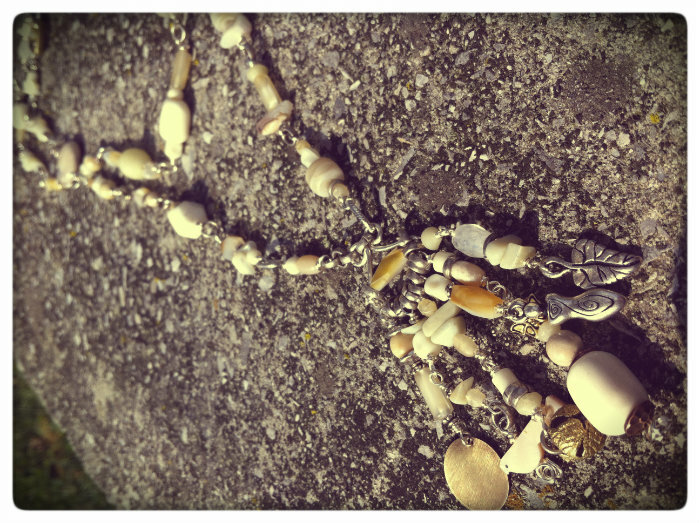 I used a lot of vintage German glass beads, beads made of bone, mother of pearl, rainbow moonstone, mookaite, and jade. It made for a very soft, very pale palette, one that is very naturalistic and lends itself well to being paired with silver wire. The pendant itself is made on a wire frame that I created out of 18 gauge craft wire. The frame itself doesn’t have to be perfect because most of it will be covered up by beads! I just hung charms from the bottom of the little “hanger” and had the necklace start out of each of the loops at the top. 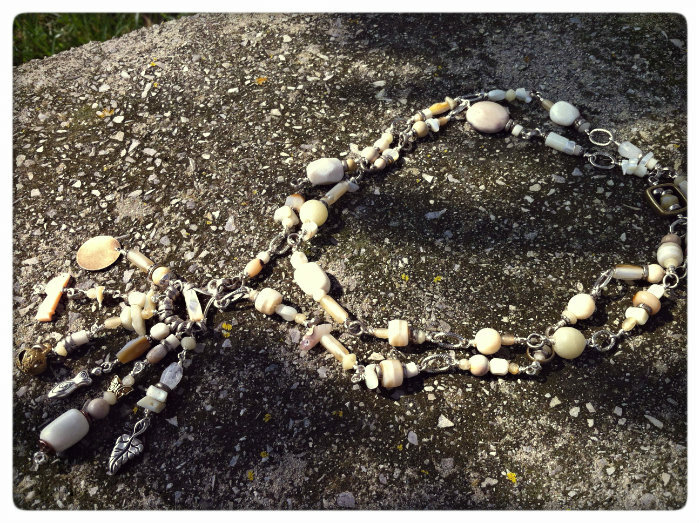 The necklace part is quite long; about 32 inches! It just slips right over your head, easy as you please. The bead choices are truly random, with no thought for pattern at all. I did try, however, to make sure and place beads that were similar away from each other. The necklace is made up of little clumps of beads and spacers, all finished off with wrapped loops on either side. They’re all connected by those amazing little open-able nickel spacers and from larger chain that also opens up. Not a super fast project, but certainly easy enough! I’ve decided to call this one A Lily for the Spectre, named after Stephanie’s second album. An ethereal necklace for an ethereal girl! Is there anyone out there that inspires you and makes you want to be a better version of yourself? Why not try to make a piece of jewelry that reminds you of them, that you put energy and love into for them as you make it? A little something you can wear that makes you think happy thoughts, reminds you that you always have something to pick you up when you’re feeling a little low. Do you have anything you always tend towards when you’re creating something new? Anything that always seems to pop up when you’re bringing things together for a new project? What does it say about your aesthetic, your style? Just something fun to think about!